Differing site conditions can increase construction costs, and can also delay the project's schedule. Normally, you will find differing site conditions during the first weeks of the project, affecting the complete project schedule and causing unanticipated delays and problems. Now let’s go over what contracts can do for us and learn the most typical differing site conditions items. Rocks: The contract specifications and the geotechnical study informed about soft soil to be removed but, the contractor has encountered hard rock instead of soft soil. Running Ground Conditions- A contractor has just found that the soil information disclosed by the Geotech study did not find this condition, and the contractor might be able to submit a claim under the differing site condition clause. Dry Excavation: All contracts documents were referring as to ‘excavations in the dry’; however, actual conditions were so different than the specifications make it impossible to excavate under dry conditions. Water Table: The Water table is found higher than expressed in the geotechnical study, or even higher than imagined. Buried Debris- A contractor has found during the excavation process, buried concrete, timber, rubble, metals, while the contract documents were only talking about roots and grass during the clearing and grubbing process. Unexpected Utilities: That water line that was hit during the excavation or that undisclosed gas pipeline found while digging are examples of unnoticed utilities that were not identified as part of the construction drawings. Harmful Waste: The environmental assessment was not thorough enough to find toxic substance all over the site. An expert is called in to solve the situation, but the overall project schedule has been altered. Swamps: The contract documents were prepared considering a dry site instead of a water-filled site, making it impossible to move around with heavy equipment. Many contracts such as AIA, ConsensusDocs and FAR have specific clauses to manage differing site conditions in construction projects. ‘The Contractor shall promptly, and before the conditions are disturbed,give a written notice to the Contracting Officer of (1) subsurface or latent physical conditions at the site which differ materially from those indicated in this contract, or (2) unknown physical conditions at the site, of an unusual nature, which differ materially from those ordinarily encountered and generally recognized as inhering in work of the character provided for in the contract. (b) The Contracting Officer shall investigate the site conditions promptly after receiving the notice. If the conditions do materially so differ and cause an increase or decrease in the Contractor’s cost of, or the time required for, performing any part of the work under this contract, whether or not changed as a result of the conditions, an equitable adjustment shall be made under this clause and the contract modified in writing accordingly. (c) No request by the Contractor for an equitable adjustment to the contract under this clause shall be allowed, unless the Contractor has given the written notice required; provided, that the time prescribed in (a) above for giving written notice may be extended by the Contracting Officer. 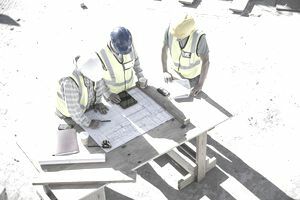 While many contracts have specific contract clauses trying to avoid differing site conditions, the reality is that it is really hard to prove that the contractor was aware of the situation. Many legal decisions have stated that these conditions are unexpected conditions and even the most expert contractor will face. A contract adjustment is not automatic, and differing site conditions must be proved by the affected contractor. The contractor must provide solid evidence showing that the construction schedule has been altered and that those conditions were inevitable. The purpose of a differing site condition is to apportion that risk, not find fault. By including a differing site condition provision, the owner assumes a part of the risk of such conditions with the expectation that the contractor will not include a contingency in its bid.